I've finally wrapped up my snail-mail themed collection, Post Haste! This collection makes me want to send, receive, sort, and deliver mail. I had so much fun designing all of the elements. I've done these patterns up in two color ways - the classic shown above, and a more lively, modern scheme shown below. Next up? I think these are crying out to become coloring pages. Stay tuned! I'm not actually in a rush for this year to be over. I know that once October is done, the Christmas prep starts. I am not a fan...I like to enjoy each day, month, and season in it's turn. But I am looking forward to the new year and my 2015 Just Desserts Tea Towel calendar being useful as well as ornamental. My proof copy on a linen cotton blend material arrived from Spoonflower this weekend, and it's now hemmed and hung, waiting for 2015 to arrive. I recently signed up for a SkillShare membership. For those of you who don't know, SkillShare is a website where designers, artists, programmers, and the like offer self-paced classes in an online community where you can get advice and feedback on your projects. It's an inexpensive ($9.95/month as of the time I signed up) way to get inspirational, expert advice and direction on your own schedule. The first class I signed up for is Pattern Design: Creating Inspiring Repeats, taught by the AMAZING Elizabeth Olwen, a surface pattern designer from Toronto. While I have been creating patterns on my own for a while, I wanted to get some guidance on how to improve my skills. I found Elizabeth's class to be engaging, inspiring, informative, and entertaining. I can't recommend it highly enough to those wanting to work on their repeat pattern-making chops. 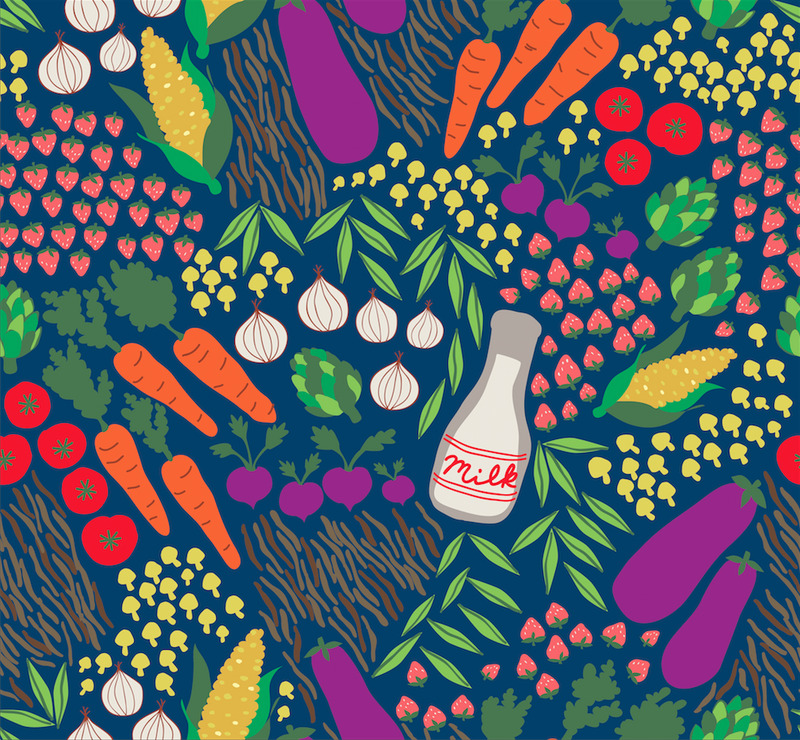 As my class project, I designed a farmer's market-inspired pattern called Market Fresh. This is a seamless, repeating pattern and I don't mind saying that I'm really pleased with how it turned out. If you'd like to see more about the class and my process designing this, check out my project page on SkillShare. I've also posted this artwork to my Society6 shop on tote bags, wall clocks, and mugs. I've just published a look book of my latest collection of patterns - Hankie Pankie. This collection of modern patterns was inspired by my love of vintage handkerchiefs. I hope you'll check them out and let me know what you think! Select patterns from this collection are available on fabric, wall paper, and gift wrap in my Spoonflower shop and on a variety of products in my Society6 store as well. I'm so excited to be blogging here on my new website! I've been working on this for a while and, while I love my Wordpress site, I need something with a little more oomph for my design work. It may not seem like a big deal, but this is a big step for me! 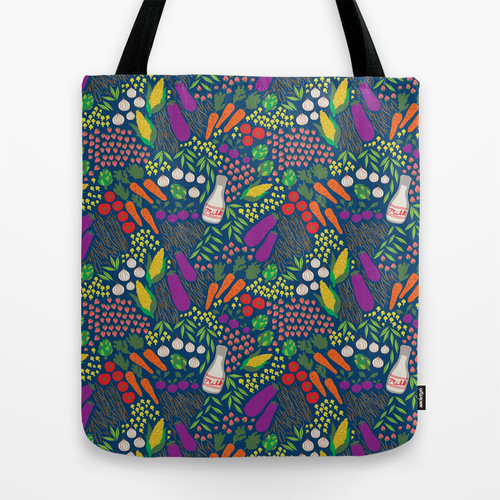 On this new site you can check out my portfolio and various products that feature my designs. Don't worry - I'll still be blogging about sewing, creating, traveling, and whatever else comes to mind. Thank you for visiting me in my new home - please come back soon!